You know Russ Taff as a multi-Dove/Grammy winning recording artist. I know Russ as my friend. More than that, he is perhaps my coolest friend — apologies, of course, to everyone else. Russ laughs hard, cries easily, and is as humble as he is wise. Oh, and his voice is astonishing. Read the previous sentences again and listen to the man sing. You’ll hear it all in that one voice. ANDY: Russ! I can’t believe I caught you at home. RUSS: Yeah, this is one of those great weekends with family. Maddie is home from college so Tori, Charlotte, Maddie and I are looking forward to being together. ANDY: I am amazed at the professional direction of your family. ANDY: There aren’t usually so many creative types in one place! Not trying to be funny, but think about it: you as a performer and recording artist, Tori an accomplished writer, Maddie soon to be an accomplished writer with a degree, and Charlotte literally creates game technology. What’s in the water where you live? RUSS: (laughing) I never thought of it that way, but my own story was one of struggling against the constant voices of people who told me to forget about music as a career. So, I suppose Tori and I have been careful to encourage our daughters to listen to their hearts in order to hear the Holy Spirit. We have always wanted them to be courageous in their choices as they followed the passion God placed inside them. ANDY: Honestly, I wish more parents would be willing to trust God with the futures of their children. Wouldn’t everyone be happier and more fulfilled? Anyway … is Tori there? Can you get her on the speaker? RUSS: She is here right now! fferent, but those differences seem to complement each other. RUSS: Tori loves dinner parties and long, back-and-forth conversations. It energizes her. TORI: And that same scenario just wears Russ out. Now, if you put him on stage in front of 30,000 people, he is absolutely fine. I’ve always said that Russ is an introvert trapped in an extrovert’s career! ANDY: (laughing) Very good! Russ, is there a song you’ve always wanted to record, but never did? RUSS: There almost was. After trying three times over several years, I finally got the sound I wanted on a Bob Dylan cut from his Slow Train Comin’ album. The song was “I Believe In You” and it was released on my Faroe Islands CD. It took a while, but I was happy with the final version. ANDY: That is one of my favorite albums you’ve done, by the way. Curiously, it is also one of the first times in my life that I ever understood the words to a Bob Dylan song! RUSS: (laughing) Thank you … I think … that was a compliment, right? ANDY: Oh, yes. Actually, I’m always blown away by your interpretation of the material you choose. RUSS: Well, I appreciate that, but when a message you have heard all your life becomes reality … and suddenly, after years of battling demons, they are defeated and dismissed… (long pause) Andy, for years I wanted so badly to do what I felt God called me to do. When I was 18, I went to a Gaither Trio concert and was so overcome with that longing, that passion, that desire to be up on that stage pouring my heart out—that I left at the intermission. It was just too much. ANDY: How does it feel now? RUSS: I am grateful. Incredibly humbled, for sure. Amazed. Look, the truth is that I am standing on that platform as a living miracle—a flesh-and-bone testament to what the Holy Spirit can and will do when we open our hearts to Him. ANDY: Thanks for your time, buddy. You are the best. 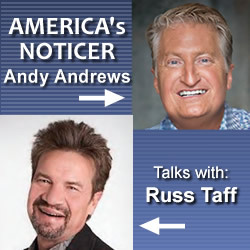 RUSS: Hey, Andy… can I add one more thing? 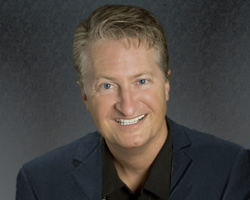 RUSS: I am so grateful for the miracle I’ve experienced, but I want everyone to understand that, by myself, I am a small sample of the vast numbers of people who have also received miracles of their own. So if you are struggling, take heart! How does the song go? Sing it with me … What He’s done for others, He’ll do for you!